Sitting at home one afternoon, I was watching my daughter (one) play with her toys, most of which are made from plastic in one way or another. It got me thinking. There are chemical additions to everything we eat, we use, we clean and even we wear. These chemicals are the bad guys. And whilst they have allowed us to achieve a hig her form of convenience, they are resulting in a lower form of health. Born out of the need to find a product that doesn’t contain unnecessary chemicals for my toddler, I created a shampoo bar called Solibar. Solibar is a natural and Vegan shampoo bar that is designed to moisturise your hair whilst giving you the amazing benefits of natural ingredients. As a baseline, all of my Solibar’s contain coconut oil, olive oil, castor oil and shea butter. Where they differ is the inclusion of super ingredients like zinc, Alkanet Root, French Pink Clay, and French Yellow Clay – which are all incredible ingredients designed to promote hair growth and keep sensitivities at bay. The best part – they’re all handmade in Melbourne! Which makes them individually unique but loveable at the same time. Categories: Beauty, Hair Care | Tags: Australia, beauty, chemicals, coconut oil, daughter, eco, eco friendly, enviroment, French pink clay, French yellow clay, hair, haircare, handmade, Health, healthy haircare, Melbourne, mum, natural, natural Haircare, olive oil, shampoo, shampoo bar, soap, Solibar, solibar shampoo bars, solibar solid haircare, solid Haircare, sustainable, vegan, vegan haircare | Permalink. I survived an Acupuncture Facial. When we think about beauty, Acupuncture is not the first thing that comes to mind. If you begin looking into beauty therapies there are loads of choices; from chemical peels to exfoliations and extractions. You can do and put just about anything on your face these days, including the not so popular – snail facial. As I am getting older, I am noticing and fixating on various things – all age related. I am looking for wrinkles, smile lines, sagging skin, dark circles and assessing my skin like a microbiologist. Fine lines is not something you are particularly concerned about in your early 20s, as you’re probably more worried about being tanned and having a plethora of outfits for the weekend. Other struggles for me included getting out bed from a long weekend on a Monday and being able to teach a bunch of smelly year 9 boys. Just when you think you have it all sorted, you reach your late 20s. Then the reality sets in. #You’reGettingOld. And there is nothing that you can do, but grin and bear it. (But don’t grin too hard or you’ll get smile lines). I once had a Cosmetic Nurse tell me that I seriously should consider injecting Dermal Fillers in my cheeks, because the future is looking ‘grin‘. I politely rejected this idea on the basis that at 25, smile lines weren’t high on my to-do list. Personally I find it difficult to trust a lot of the beauty therapies these days, especially treatments for my face. I am concerned that too many cleansers, toners, creams, peels and exfoliaters will upset the natural pH level of my skin. I keep coming back to ‘the olden days’ where a variety facial applications were not available and you most likely just washed your face with a bit of soap and water. (I still do). If I look into the mirror right now, I can see imperfections. But mostly I can see perfectly balanced natural skin. I know that if I use anything oily or chemical based, my skin will break out. It must be genetic, because my mum has the same result. So here is the conundrum: what happens when you feel like you should look after your face, but you are worried about every single product, that you choose to use nothing instead? About a year ago, I looked into the mirror and for the first time in my life I was scared shitless by the lines on my face. I knew it was time to do something but I didn’t know what. Since then I have looked into natural treatments for my skin that won’t upset my pH level and will not cause unnecessary breakouts. It was this time that I stumbled onto a Cosmetic Acupuncture. All of which should really be able to help with my fine lines and dark circles that have appeared over the years. Cosmetic Acupuncture has several other benefits outside of these including; scaring, acne, tone and discolouration, dehydration and skin texture. Of course with anything like this – individual results will vary. A few days after my first treatment, my skin was absolutely glowing. It most certainly refreshed and revived my skin and my face felt amazing. I could not have been happier with the results. So much so that I am recommending that you go and give it a try. All in all, I will continue to do Cosmetic Acupuncture for the rest of my life. I can not recommend it more highly for all of those niggly skin problems. However if you want the right results, you need to choose a great Chinese Medicine Practitioner that will be able to tailor the facial for your individual needs. If you would love to see Tory – please head to The Acupuncture Company in Brighton, and they don’t just do Cosmetic Acupuncture. Categories: Beauty, Cosmetics, Fitness, Places, Skin Tightening | Tags: acupuncture, blood circulation, chinese medicine, chinese medicine practitioner, collagen production, cosmetic, cosmetic acupuncture, face, facial, fine lines, ph level, skin, skin elasticity, snail facial, the acupuncture company, tory dacy | Permalink. Want to WIN a makeover? Want to WIN a VIP hair and makeup makeover by a TOP international brand? Then today is your day… I just entered. It is something big! I am sharing it with you so you can have a chance as well. Categories: Beauty, Hair Care, Melbourne, Products, Social Media, Social Media Marketing | Tags: girl, gorgeous, hair, makeover, pretty, win | Permalink. then you are missing out!!! The best part about this video is that every time it is shared $1 from Invisible Zinc will go to supporting the prevention and cure of skin cancer by donating to the Melanoma Institute of Australia! So get sharing! It is a great cause! Categories: Beauty, Products, Skin Care | Tags: #IZSpotCheck, dannii minogue, donation, invisible zinc, melanoma, melanoma institute of australia, skin cancer, summer | Permalink. Love My Body specialises in health retreats and runs 6 retreats per year in Bali, Byron Bay and out of Melbourne. Our health retreats are 6-7 days long or 3 days and leave everyone feeling amazing- with a focus on raw food, green food, lots of training and physical challenges, sunshine, massages, reading, thinking and healing. 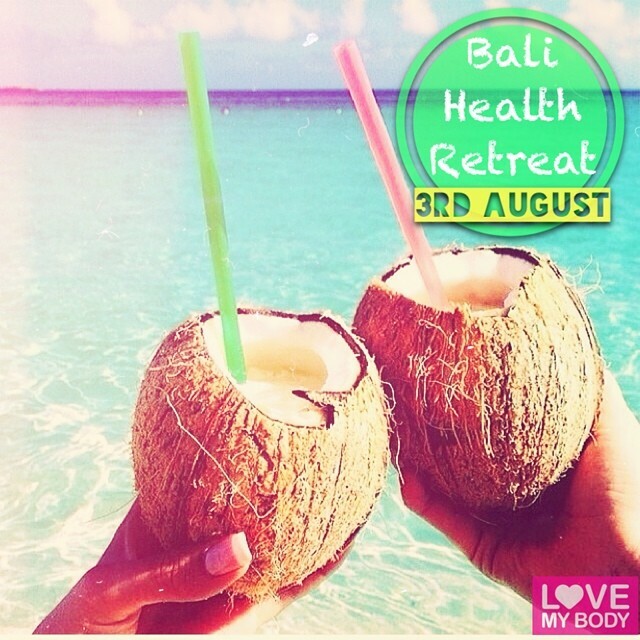 Places are also already filling up for our Bali retreat! We stay in a beautiful village nestled in the hills of Ubud which has the most beautiful surroundings and natural noises. The food is fresh locally grown and totally free of any nasties, most of which is grown in the village itself and we sip on fresh lemongrass and ginger tea all day long the is constantly re-filled at your bungalow door. We train 2-3 times per day, plus treks up and around the mountain including a trek up the volcano at 3am to see the sunrise. Also included in your package is a full body massage and pampering session at one of Ubud’s best day spa’s, dinner out one night to an organic vegetarian restaurant, a half day at the hot springs after our trek up the volcano and a bike tour. This retreat will leave you feeling clean, light and physically challenged- and with a noticeable change in your body shape! Your package also includes your transfer to the village on the day of the retreat and to your next destination afterward. you can arrive any time on the afternoon on day 1 and leave around 9-10am on the last day. Flights are excluded but if booked early you can get return flights under $700. Airasia/Jetstar currently has flights for under $500 return. We recommend booking flights as early as possible to keep the cost down. *Deposits (50%) for both Bali retreats are due for August retreat by July 15. Our next Byron retreat is running September 15th – September 21st 2014. Places are already filling up! On average we train for 3-4 hours per day (it sounds intense but because it is so varied and spread out over mornings and evenings and there is a group of us, you will find it challenging but achievable as a group). The food is from the organic byron bay kitchen- organic raw style food, lots of green! It is delivered to the house each day. We stay in a beautiful modern large house near the beach and town. Days are spent mostly beach/shopping/pool but also in the itinerary, you have 1 hour massage/healing session. 30 minute card reading. 1/2 day of surfing. Restorative yoga every second evening and your bike for the week which we get around on a lot. Please note that we have group discounts on all activities and if you were to go off and do this holiday on your own you couldn’t do it at this cost. There are cheap flights with Jetstar (around $300 return). You are expected at the house by 2pm the day of the retreats and we finish up around 9am on the last day. We use the shuttle bus service from Byron airport excede.com.au which is $20. *Please reserve your spot in this retreat ASAP. Payment due July 15th. In our last Byron retreat most of lost 2-3 kilograms (including me!) But the main difference was how clean light and energetic we felt afterward- most of the girls have since completely changed their lifestyles. this is one retreat not to be missed! These retreats will run based on attendance so express your interest now! They are 2 nights and 3 days long (Friday-Sunday). You will be expected at the house by lunch time on the Friday and will leave late Sunday afternoon. They are $850 (excluding travel). In these retreats we really make the most of 3 days! They are very detox style and educational- with loads of training, green smoothies and vegetables and educational programs with me each night- on nutrition, weight loss and changing your lifestyles to support a healthy weight and happy outlook. There will also be a day spa pampering session included at one of Daylesford’s spas and the large house we stay in is simply beautiful! I promise to leave you bewildered at what we can achieve in just 3 days! Full payment for our Easter retreat is required for our Christmas retreat October 1st. Check out the testimonials section to read how effective the Love My Body Health Retreats really are! Or go to our blog www.lovemybodyblog.com to read my post on both a Bali and Byron retreat. Categories: Beauty, Fitness, Food, Guest Blogger, Health, Travel | Tags: Bali, Byron Bay, clean eating, Fit, fitness, Food, green food, Hayley Roper, Healing, Health, Holiday, Love My Body, Massage, Mornington Peninsula, organic, Personal Trainer, raw food, travel, Yoga | Permalink.